Y Bwthyn, Llanina, New Quay, cottage sleeping 4. Less than 150 yards from Llanina's wide sandy beach, Y Bwthyn is the upper floor of a beautiful stone cottage in the grounds of the 17th century Llanina Mansion. The cottage has under floor heating and provides everything you need for a relaxing holiday. 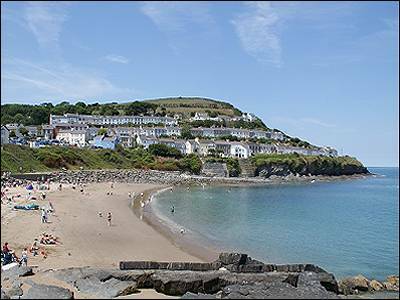 Y Bwthyn is ideally located in a coastal setting, yet close to all amenities with the pretty seaside town of New Quay is only a mile and a half away. Traethgwyn and Cei Bach beaches are only a short walk away along a woodland riverside footpath. One well behaved dog is welcome. 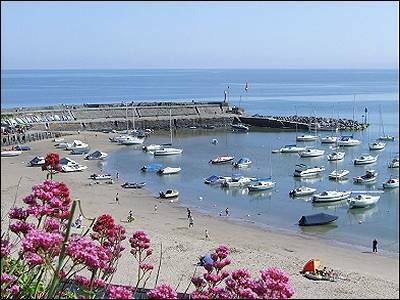 Short breaks available - see calendar. First floor. Although Y Bwthyn is upstairs on the first floor, the door is at ground level at the end of the building. This holiday hideaway has two bedrooms and sleeps four, one double bedroom and one twin. There is a modern open plan sitting/dining room with TV with Freeview, DVD and CD /radio. The well-equipped kitchen has an electric cooker and hob, microwave, under counter fridge and dishwasher. The cottage includes all the usual amenities, iron/ironing board and hairdryer. The bathroom has a bath with an overhead shower, WC and washbasin. Weekly bookings start and end on Fridays at Y Bwthyn. Short breaks Mon-Fri (4 nights) or Fri-Mon (3 nights) only where price is shown. All bed linen ,towels and electricity are included. Convenient off road parking close to the door. Woodland, beach and river walks close by.